About Koa » Hardwood Hat Co.
Hardwood Hats - an original from our shop on the Big Island of Hawaii to you. Koa is the best known of the endemic Hawaiian woods. It is recognized world wide for it’s remarkable variety of grain figure which ranges from plain, to curly, to deep fiddleback. The colors can go from reds to chocolate browns, with the sap wood sometimes even a bleached white. The grain is fine, similar to Honduras mahagony, but it is the figuring that sets koa into a class of it’s own. Chatoyancy is a property that is usually attributed to gems, the cat’s eye effect or shimmer, which gives a sense of depth in the gem. This property can also be used to describe some of the more dramatic pieces of curly, tigerstripe and fiddleback, koa. This figuring gives the wood a three dimensional quality; and depending on the angle the wood is viewed from, it can take on several completely different characters. In pre-western contact times koa was used to build canoes, spears and paddles. The canoes were carved out of a single tree, which was carefully chosen, spiritually and physically for the purpose. 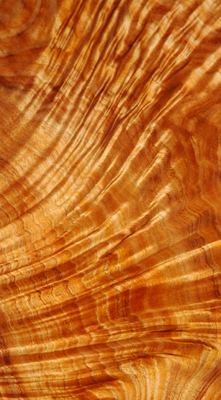 Today koa is valued for furniture, guitars, boxes, paneling and bowl turning. It is interesting to note that Hawaiians of earlier times did not use it for bowls or platters because of an unpleasant flavor associated with the wood. The trees grow successfully from 1500’ to about 6000’ in elevation and are very sensitive to grazing animals. Koa leaves change totally in appearance from seedling to older growth. They start out as lacy, divided leaves and then fuse into a single sickle shape. Koa is currently on the endangered species register due to concerns about the habitat it provides for endangered native Hawaiian wildlife. All the koa that goes into our work comes from standing deadfalls, trees which have already died, but are not rotten, or fallen timber. Also, the pieces are designed to make maximum use of the wood, with minimal waste.